Is wine a product of culture? While such a concept may seem comical to some, wine producers in Ile-de-France think otherwise. Winemaking in Paris and in the surrounding region is not lucrative due to the absence of vine-planting rights, which means that wine produced here cannot be sold in commercial markets. Why then have all of these individuals, associations and municipalities, for more than forty years, been multiplying vineyards (150 to be exact) on over eleven hectares of land? In addition to there being a cultural objective, there is also a patrimonial and pedagogical motivation behind their activity. Remembering the long history of wine in Paris and its surrounding region, reviving that tradition seems especially important today, since wine is no longer only a question of label or grape variety but an essential element of the "art de vivre" of our civilization. In an effort to promote suburban "crus," L'Association Vignerons Franciliens Réunis (VFR), the Association of Francilien Wine Producers, comprised of inhabitants of the Ile-de-France region, has put together a tourist map listing almost a hundred winemaking and tasting circuits in the region. And why not? After all, Haut-Brion in Bordeaux, Noble-Joué in Tours and Bellet in Nice are all wines from suburbs of large cities! The new vineyard in Paris is part of the folklore of the charming hilltop neighborhood of Montmarte. Souvenir and symbol of the omnipresent vine in Ile-de-France, the picturesque Clos Montmartre, replanted in 1933, contains 1,900 vines of twenty-eight different grape varieties including 75% Gamay and 20% Pinot Noir. With a production of 1,700 bottles per year, this wine, unavailable on the market, is reserved for the use of the 18th arrondissement's City Hall. In the past, this wine was considered to be rough swill possessing diuretic qualities, yet more recently it was recognized during a symposium on wines from Ile-de-France. Next, there is the wine of the elevated, Seine-side suburb of Suresnes, replanted in 1965 and composed of one hectare of Chardonnay, Sauvignon Blanc and a bit of Sémillon. In nearby Issy-les-Moulineaux, a spectacular effort has been made by Yves Legrand, owner of local chalk quarries. His white wine, Le Clos des Moulineaux 1995, received first prize in a 1996 contest of wines from Ile-de-France. This "vineyard," revived in the late 1980's, is composed of a small plot of land with 265 vines, two hundred of which are Chardonnay and sixty-five are Pinot Beurot, or blush grapes. The "vendange," or harvest, is accomplished each year by a group of fifth-graders as part of their ecology education. The winemaking process is overseen by Legrand, and ageing is done in oak barrels. A dry white with well-developed floral notes, the 2000 harvest is still pleasant to drink, although one shouldn't expect too much originality from this wine, whose grapes are grown practically under the RER train tracks. Each bottle, cheerfully illustrated with a student's drawing, is sold at the Caves Yves Legrand in Issy-les-Moulineaux for 15 euros, which is donated to the town's education treasury. The wine is also available at Apicius in Paris. At the Clos des Morillons in the Square Georges-Brassens, the harvest happens every year, and, like in other wine-producing areas of Paris such as Bercy and Belleville, it's quite a festive event. If you're around during the fall harvest, don't miss the vendage party at Chez Mélac, a wine bistro on the rue Léon Frot in the 11th arrondissement. The Morillon is an old-fashioned Pinot Noir grape present in Ile-de-France and in the Champagne region, where it is harvested earlier than its Burgundian variety. It was cultivated in the 16th century as a grape for eating and today lends a light color to its cherry-perfumed wines ; and while it does not last long in the mouth, it possesses a delicate flavor. 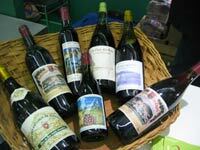 Drinking wines from Ile-de-France is, more than anything else, a symbolic gesture, a salute to its rich historic past. The map is available for free at tourist offices. More information at www.vigneronsfranciliens.com.